Select Stores including: our friends at Amoeba (SF), Bird & Beckett Books & Records, Streetlight (SF and Santa Cruz), The Music Store (SF) and Down Home (El Cerrito). “Grounded in tradition, old-time string band music and mountain blues but with open horizons that take them, subtly, to other parts of the planet, they have a haunting spookiness, an organic pulse, and most importantly a clear vision...Instrumentally they're truly inspiring, getting original textures out of conventional stringband instruments and mixing them with (in this context) oddities like bass ukulele, harmonium, mbira, cello and Vietnamese jaw harp and bau zither. Vocally, they have that lonesome white blues sound which has its ancestry in Dock Boggs and the Carters but again they take it somewhere else...a consistently startling and addictive album." 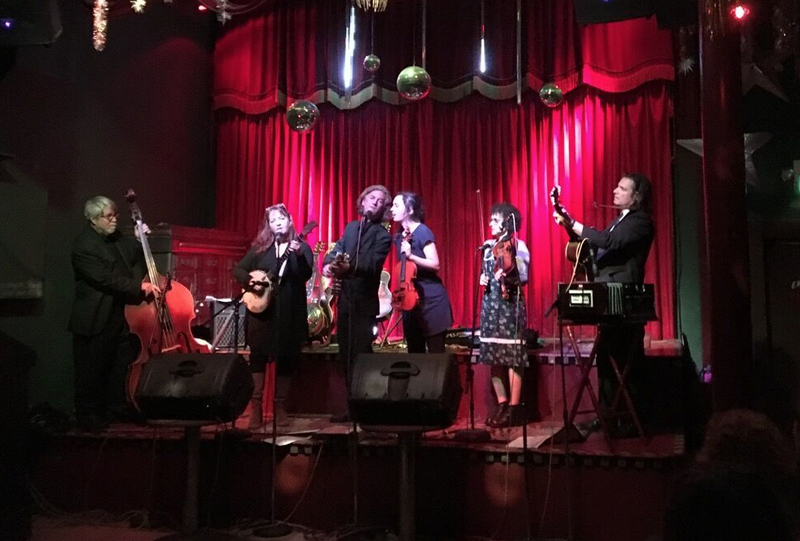 "This San Francisco quintet keep true to their old-time string band heart, yet in subtle, weird ways, they exaggerate the slightly-crazed aura of the rural pre-radio era music. It makes for a haunting, sophisticated trip to Appalachia. Mixing originals and traditional songs flawlessly, this might be the finest band to come out of the string-band resurgence." "The Crooked Jades are embarrassingly addictive....they grab you by the throat, preach damnation, and move your hips all at once." "The two adjectives that keep coming to me during repeated listenings to the Crooked Jades are profound and transcendent. I have looked those words up wondering if that’s what I really mean. Profound means “deep” and “intense”. Transcendent means “awe-inspiring” and “moving”. Yes, that’s what I mean. This is visionary music, forged from the raw materials of old-time forms and instruments. I don’t want to get into a discussion of what’s old-time and what’s not; there’s enough ongoing conversation on that subject already. It’s easy to forget, though, that the first old-time music recorded was a mirror of the times the musicians lived in. That was almost a hundred years ago. Here, in the beginning of the 21st century, people in appreciable numbers are feeling as though they’re teetering on the brink of apocalyptic times. Through the lens of tradition, the Crooked Jades are voicing this feeling convincingly and beautifully." "Depth of quality, performance & passion make this band a cross-generational, cross-genre charmer." "The Jades, in other words, aren’t playing your grandparents’ old-time music. Nor are they performing the stylized stringband music that our revivalist contemporaries adapted four or five decades ago and take to festival stages and recordings into the present moment. This is sepia tones, bent angles, unexpected accents, unanticipated sounds. It’s banjo ukuleles, minstrel banjos, plucked fiddles, bowed basses, Hawaiian slide guitars, harmoniums, Vietnamese jaw harps, pianos played clawhammer-style. It is the familiar embraced by the strange. It is the antique and the modern, in a distinctly idiosyncratic meaning of each. This is a music that feels at once fiercely inside time yet also above and around it. And all of this is accomplished without a hint of rock, electronica, or the other flourishes to which less imaginative folk bands turn when they think they’ve exhausted the language of tradition. Tradition, the Jades insist, speaks in a host of tongues. If you know what you’re doing, you can speak in as many as you’d like, sometimes at once." "American Gothic for a new age." "Wild, wooly, totally unpredictable but always tasteful, soulful. They’ve got chords in unexpected places, out of this world harmonies and some of the most powerfully arranged material I’ve ever encountered." "This young quintet rooted in old-time music toss African and Asian instruments into the usual sawing fiddle, gnarly banjo, guitar and mandolin stew. There are eerie folk songs, instrumentals and a maniacal Vietnamese Jews harp." The Crooked Jades ensemble, with its polished but vital roots sound, is no stranger to modern media. They’ve contributed to the soundtracks of the PBS documentary Seven Sisters: A Kentucky Portrait and the Oscar-nominated dramatic movie Into The Wild. Their sound can be as cinematic as it is tradition-grown. If you have it, you’ll be richly rewarded. Visualize the dancing in your mind’s eye while this lovely, lively and compelling music flows into your ears. The Crooked Jades’ soundtrack for the Kate Weare Company’s Bright Land is happy evidence that old-time music is not only a relevant contemporary art form, it will probably prove timeless. "I love The Crooked Jades. Weird, ecstatic music. How can anyone with a brain dislike it? What was the Aldous Huxley line? "Stronger wine, madder music." "The Jades are the perfect combination of fresh energy and raw antiquity, staying so true to the old stuff you feel like you’re hearing ghosts of the past. Yet their performance is vibrant enough that at one point I actually had an honest to goodness religious experience."